This outer suburban outpost lurks one stop before Cheshunt, just beyond the edge of Greater London, in the rarely-seen Zone 7. 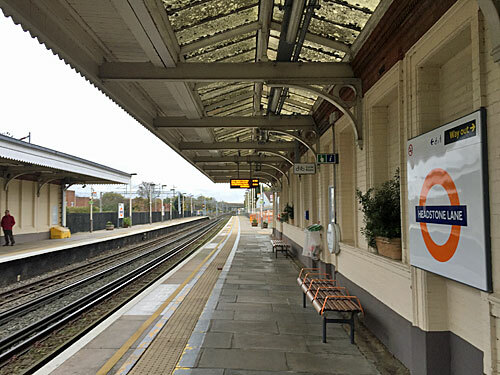 It's also one of the most used stations of my childhood, because my grandmother used to live just round the corner, and it's here that my Mum grew up. I remember getting the slamdoor from Liverpool Street and alighting on the viaduct platforms, then heading down the dark and gloomy stairwells to the street outside. The stairs are much brighter now, with strip lights and orange-trim handrails, and no sign of the wooden treads I stepped down as a boy. Blimey, there are also now ticket gates on the way out, and a couple of staff standing close by, the kind who write a Thought For The Day in marker pen as a welcome message on the whiteboard outside. A spruced-up entrance opens out onto the top of Waltham Cross High Street, beside a pub I suspect my grandfather once drank in, and a parade of shops with diminishing cultural overlap. Holy Trinity church looms symmetrically across the mini-roundabout, and a Metropolitan horse trough slowly fills with leaves. The station's named after the royal palace up Theobalds Lane where James I held court, now a characterful public park complete with cafe, hedge maze and tiny zoo. The name's also occasionally misspelled as Theobolds Grove, most embarrassingly on the day the Overground took over, but I'm pleased to report that all the roundels subsequently installed on the platform are correct. But why wait here when trains from Waltham Cross station are faster... unless you have business in the neighbouring avenues and terraces, which alas I no longer do. Who would have guessed that a least used station would lie quite so close to the centre of the city? 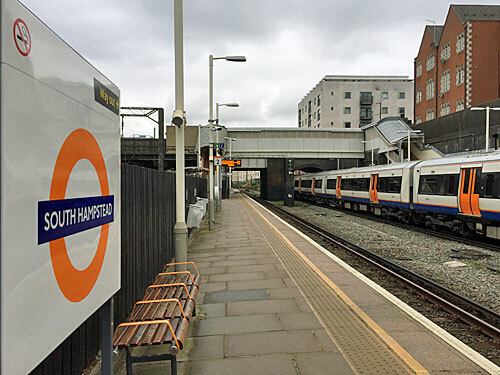 South Hampstead is the first stop out of London Euston, in the dip below the Finchley Road, amid a highly residential zone. But it's also only a short walk from Swiss Cottage, where trains are considerably more frequent and ply the heart of the West End, hence the Jubilee line station sees 16 times as many passengers. Still, this is the ideal stopping off point if you've ever wanted to admire the stepped terraces of the Alexandra and Ainsworth estate, whose modernist architecture begins just past the closed-down dry cleaners on the other side of the street. South Hampstead station isn't easily spotted, being little more than a hut on a footbridge, but large enough to contain an office where members of staff wait to sell tickets and a couple of machines which will soon replace them. Press the right parts of the screen and you could buy an Off-Peak Return from Penzance to Wick in three weeks time for just £356. But safer to touch in and step down into the open cutting to await the slow train to Watford, which emerges dramatically from a tunnel at the far end of the platform. Or watch the Inter Cities whizzing by to Euston, where you too could be soon, just not quite so quickly. 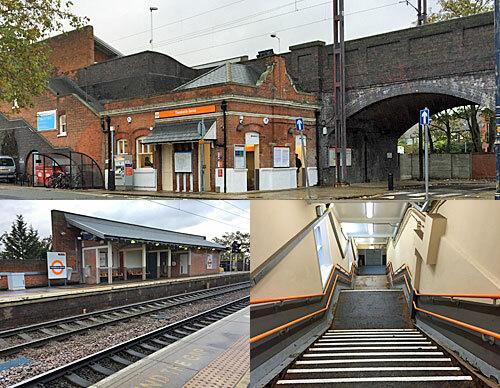 Almost half an hour up the line, in the wilds of Harrow, is the Overground's fourth least used station. Headstone Lane may have been a 'major' road in Middlesex's rural past, but no longer is, and now funnels residential traffic up the western edge of Harrow Weald. 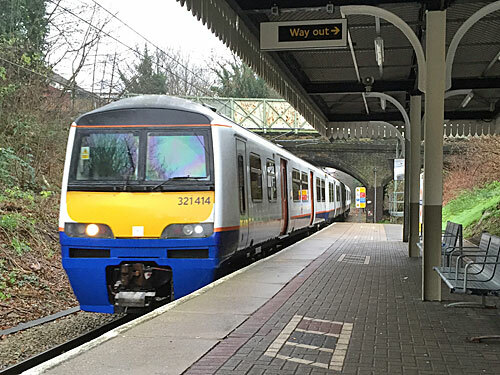 The station sits in a bend where an actual lane still extends into Pinner Park, a large expanse of proper farmland, trimmed back a little by the occasional playing field. The station building is small, smart and square-ish, most probably dating from between the wars, and embellished by two spikes at each end of its tiled roof. Something of the nature of the local area can be gleaned from the sole advert tied to the railings immediately opposite the entrance - a laminated poster for the weekly delights of Hatch End Chess Club. Grab your Metro from the bin outside, or a selection of mundane leaflets from the rack inside by the ticket office. A deep staircase descends to platform level, these covered at one end by canopies that've seen better days, and whose rooftop glass could do with a good scrub. The northbound platform boasts an impressive-sized 'Cycle Room', with space for a couple of dozen wheeled steeds arrayed along the far wall. No need to lug them up the stairs either, because a gate further along the platform is open to the street via a convenient ramp, which means Headstone Lane is step-free (hurrah) in (alas) one direction only. Be sure to touch out on the reader, and boost next year's ridership figures. Back on the Lea Valley lines, Stamford Hill is one of an underused trio of stations serving northern Hackney. Southbound trains mostly empty out at Seven Sisters, where hordes of Tottenham and Enfield residents alight to speed into the centre of town on the much faster Victoria line. Stamford Hill thus has a somewhat lonely feel, not helped by all the boarded-up windows in the Victorian station building which spans the tracks. Full marks, then, to Gladesmore School who turned up and painted a mural along the footbridge leading to the northbound platform, featuring a colourful variety of characters from the local community. The staircases are open air replacements for the long-removed originals, and somewhat precipitous, demanding care and attention from passengers ascending or descending. On the southbound platform the former shelter is closed, whereas on the northbound it's merely taped off temporarily behind a strip of plastic, which someone has kindly ripped so that passengers can wait on the benches inside. 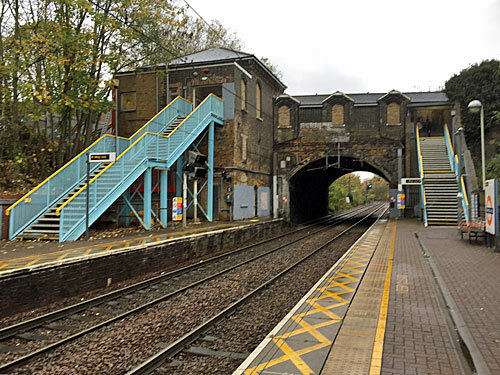 I was shocked to spot a far more serious misdemeanour at the far end of the platforms, as a would-be passenger vaulted the security fence to gain entry from the street, then walked nonchalantly across the tracks to reach the London-bound side. He'll have saved a few pounds on a fare, but I wouldn't rate his chances of reaching retirement.